In April 2017, SMU’s Central University Libraries uploaded 664 items into CUL Digital Collections. Roth’s, ca. 1940s-1970s, George W. Cook Dallas/Texas Image Collection, DeGolyer Library, SMU. 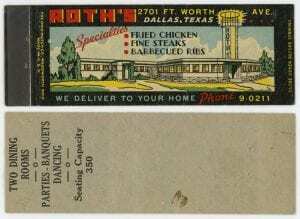 54 matchbook covers that advertise Dallas businesses, restaurants, banks, and hospitals. Roth’s, Lone Star Donuts, Tupinamba Cafe, El Chico Cafe, Pelican’s Restaurant, Lyon Gray Lumber Co., First National Bank in Dallas and Gaston Episcopal Hospital are included in the set. 35 images, including 34 of locations around Texas showing various Texas courthouses, as well as an image of a Curtiss A-3B Attack Falcon, part of the 13th Attack Squadron based at Fort Crockett, Galveston, Texas. Also in this set is a cyanotype of a two-story house at an intersection in Austin, Texas, with the Capitol dome visible in the background, and a series of photographs by Carl John Ekmark showing troops stationed in Texas, especially at Fort Sam Houston. [1844 Republic of Texas Treasury Warrant Issued to President Sam Houston for ”Indian Purposes”], DeGolyer Library, SMU. 7 items on Texas City: 2 photomechanical print postcards showing the Texas City Disaster Memorial, and 5 RPPCs depicting various views of Texas City, including several showing the damage from the Texas City Disaster, which took place when the S.S. Grandcamp exploded on April 16, 1947. 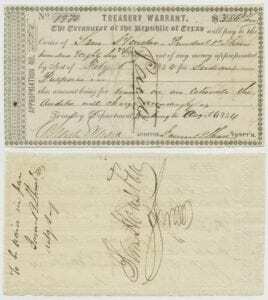 22 documents, primarily correspondence from John Coggswell Conner, a Texas Representative who was elected as a Democrat to the Forty-first Congress and the Forty-second Congress, serving (1870-73), as well as a Texas Treasury Warrant issued to Sam Houston, another Treasury Warrant issued to Isaac Parker for the purpose of negotiating ransom for his nephew John Parker, and an Oath of Enlistment to the Army of the Republic of Texas. 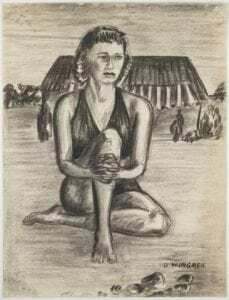 Untitled charcoal drawing by Dan Wingren, Bywaters Special Collections, SMU. 63 drawings by artist Dan Wingren, including a sketchbook of drawings and watercolors from his time in France and Italy. Many of the drawings in the sketchbook depict buildings and streets. Other drawings in the collection include studies on human figures in various poses, and sketches of rooms and furniture. 3 pictures of Mar-a-Lago from the Robert Yarnall Richie Photograph Collection. These aerial views of the home were taken less than a decade after construction was completed in 1927. Mar-a-Lago was originally built for Marjorie Merriweather Post, heiress to the Postum Cereal fortune and founder of General Foods, Inc. The Daily Campus, Volume 59, Number 5 September 11, 1973, SMU Archives. 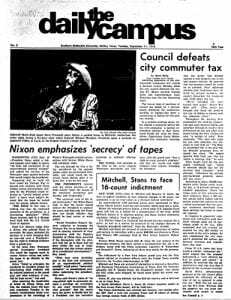 1971: 120 issues of The Daily Campus, including stories by SMU student journalists reporting on the conflict in Vietnam, the Pentagon papers scandal, and a rash of bicycle thefts on campus. Among the visitors to SMU campus in 1971 were Ladybird Johnson, who appeared for a book signing tour, and Princess Grace of Monaco. Notable issues covered include incidents of arson at the Prairie View A&M campus and the Oklahoma University campus in Norman, where student activists were accused of setting the fires, and a Dallas street protest that coincided with a jail riot, giving Dallas County Sheriff Clarence Jones reason to accuse certain SMU students of agitating the prisoners. 1973: 111 issues of The Daily Campus, including features on the Watergate scandal and and the beginnings of questioning the political integrity of the Nixon Administration. 1974: 113 issues of The Daily Campus, including stories on the value of tenure for SMU professors, the fallout from Watergate, Gerald Ford’s presidency, amnesty for young men who fled the Vietnam War draft, women’s rights, and integration. Unusual events from this year include the theft of a large bronze statue from campus grounds and the prosecution of campus streakers. 1975: 113 issues of The Daily Campus. Many stories reflected the changes in campus life that year, including new staffing and protests by students. One issue includes coverage of President Ford giving a speech at the convocation. [FCM Train Exiting Tunnel], ca. 1876-1877, by Casimiro Castro, DeGolyer Library, SMU. 6 drawings, ca. 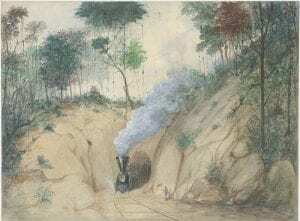 1871-1876, from Pictures of Mexico, including 5 gouache watercolors by Casimiro Castro, of Ferrocarril Mexicano trains, railroad bridges, and tunnels in Mexico. 2 photographs, ca. 1885-1899, from the Collection of Abel Briquet Views of Mexico, showing Ferrocarril Mexicano’s Metlac and Wimer railway bridges in Mexico. 15 real photographic postcards, ca. 1910-1918, from American Border Troops and the Mexican Revolution. Highlights include several photographs of the “Fiestas del 1er Centenario de la Independencia” historical parade, held on September 15, 1910, featuring men wearing elaborate traditional Mexican clothing in a variety of military formations, and one photograph by Walter Horne of a women and several children behind barbed wire in a refugee camp. This entry was posted in Robert Yarnall Richie, SMU Student Newspapers, TexTreasures2017. Bookmark the permalink.